When Game of Thrones first aired back in 2011, no one knew it would become the huge, cultural phenomenon that it is today. Equally, once it reached the dizzying heights of one of the greatest television shows of all time, very few people would have predicted its end just eight seasons later. Most people wouldn’t walk away from the money-making machine that is Game of Thrones, but that’s exactly what creators David Benioff, D. B. Weiss, and the rest of the Game of Thrones cast and crew will do later this year when the final season of the show concludes in just six, incredibly anticipated, episodes. 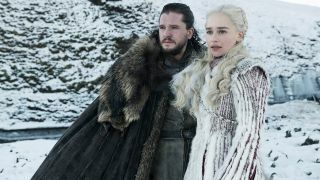 It may sound like the Game of Thrones stars are setting us up for disappointment when the finale airs just over six weeks from now, but when they’re actually allowed to talk about the Game of Thrones ending, they have nothing but praise for the finale. “My reaction initially when I first read it was just enormous relief, actually,” John Bradley, who plays Samwell Tarly on the show, tells me. “You hear all those stories, all about those legendary, slightly weak endings that great shows have had before. Those endings that almost compromised the quality of what you’d seen before." Rory McCann, who plays fan favourite Sandor Clegane/The Hound, echoes this sentiment: “Sure, not everyone will be happy, because they’ll have their own theories that they’ve thought for the last few years on how it’s all going to end. And oh, whoopie doo, it’s not worked the way…” But when it comes down to it, that’s what Game of Thrones has been about from the very beginning; the unexpected. “When it came to the end of season 1 – I’d been following Ned Stark as the main hero, and then they kill him,” says Kristofer Hivju, who’s played Tormund Giantsbane since season 3 but watched the first two seasons as a fan. “It’s like Rocky dying in the middle of the first Rocky movie! It just changed the perspective of how they tell a story. But there are so many moments that are unexpected. It’s not normal in normal storytelling.” Talking to the Game of Thrones cast, Ned Stark’s shock death at the end of season 1 comes up again and again as a defining moment in the show. “I mean, we all freaked out when we read the scripts,” adds Sophie Turner, who plays Sansa Stark. Gwendoline Christie, who’s played Brienne of Tarth from season 2 onwards, adds: “I cried [laughs]. I cried. I went up to Dan Weiss and went: [sobs loudly] [laughs] – just to say thank you. And just sobbed. Just sobbed.” Despite how emotional everyone felt about the end of the show, they all agreed Benioff and Weiss had outdone themselves. “It was a 10-minute standing ovation, just looking at David and Dan, and going, ‘Wow. Thank you.’ I don’t know how they’ve done it,” admits McCann. Then there’s the fight sequences – Christie knows only too well how tough they can be. “I mean it’s very hard and difficult to fight for 10 hours,” she tells me. “Even when there are people helping you, it’s really hard. Because you’re also in a very heavy costume; you’re often fighting people who are stronger than you, bigger than you, have more experience than you; and it is really hard work." "I don’t think I’ll ever be in a better thing ever." All the pain, the long nights and the hard work will surely pay off when almost the whole world tunes in for the season 8 premiere this Sunday, April 14 though. With such a big moment in television history on the horizon, do the Game of Thrones cast plan on watching it for themselves? “My fiancée used to have Game of Thrones viewing parties before he met me, so I was like, ‘I want a Game of Thrones viewing party’,” Turner reveals. “We’re only there when we’re shooting our own bits,” says Cunningham. “So when it comes out, we have an appointment. We record it, and then we all get— in my house, six of us sit on a couch and watch it together. I’m a fan. So I’ll be going, [claps] ‘Ooh, it’s on!’ I’m genuinely a fan. I love it. I really love it.” It seems everyone is a Game of Thrones fan and, with the end in sight, the only question that remains is, what will we do once it’s all over? Find out which Game of Thrones moments the cast still aren't over, from the Red Wedding to the first appearance of the Night King.